This post tagged, What is Bilingualism? (Definition, Types and Examples, focuses on the concept of bilingualism in the world, and its forms. 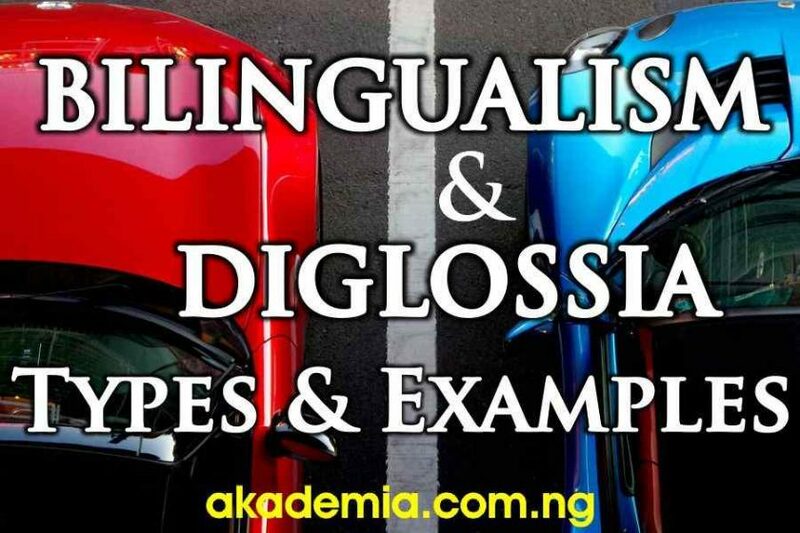 It examines also the concept of Diglossia and its various manifestations, especially examples of diglossic situations. Bilingualism is the existence of two different languages within the speech repertoire of either an individual or a society. By speech repertoire, we mean the totality of languages, dialects and their superposed social and cultural variants that an individual possesses. We can liken speech repertoire to the brain, memory or linguistic store that harbours all the languages and the varieties of languages in individual possesses. When a society has two different languages existing within it and the two languages are assigned similar or different functions within it, then there is societal bilingualism or we can say such society is bilingual. The Canadian society, which acknowledges and uses French and English, assigns functions to the two languages. It uses both, French and English as official languages and languages of interaction. That is, the society uses both languages as lingua franca and national languages. Nigeria is also an example of a bilingual society which assigns different roles to both the official language and the regional languages. English has the role of official language while the regional languages have the roles of interaction. An individual is bilingual when they have two languages in their repertoire. Coordinate bilingualism occurs when an individual has or possess the ability to use or speak the two languages proficiently. Such an individual is a coordinate bilingual. An individual is a subordinate bilingual when they are proficient in one of the two languages. This language in which they are proficient is usually the mother tongue; then they can speak the other language, but not with great proficiency as the other language. An incipient bilingual is just able to use one of the two languages proficiently and this is usually the mother tongue, but with a partial understanding of the other language. This is similar to colonialism. This leads to a bifurcation from which diglossia inevitably results. It erodes the culture of the people; a bilingual is also bicultural. Linguistic Incompetence. It makes people subordinate or incipient bilinguals. Diglossia a situation in which two languages (or two varieties of the same language) are used under different conditions within a community, often by the same speakers. The classic instance of diglossia in English may have occurred in the period following the Norman conquest of England, during which time a ruling class that increasingly spoke a mixture of French and English among themselves also communicated with “commoners,” who discoursed in Old English/Middle English in their milieu and often never learned French. This former ‘diglossic’ condition has contributed to the richness of English, in terms of words, so that ‘mutton’ is the Frech form of sheep, the first emanating from the tables that served it, the second resulting from the usage of those who tended and killed the animals. Bilingualism is commonly defined as the use of at least two languages by an individual (ASHA, 2004). It is a fluctuating system in children and adults whereby use of and proficiency in two languages may change depending on the opportunities to use the languages and exposure to other users of the languages. This occurs where two or more codes (varieties of languages) exist side by side in a speech community and each has a definite role to play in communication. In other words, there exists the High (H) and the low (L) varieties. The H variety is divergent, highly codified superposed variety (superior/standard) which contains a large and respected body of literature. The mode of learning is largely by formal education and it is used for most written and formal spoken discourse. However, speakers of the community do not normally use this variety for ordinary conversation. Diglossia is the assignment of roles to different varieties of languages which exist side by side in a bilingual or multilingual speech community. For instance, in Nigeria, the Standard Nigeria English or educated Nigeria English (NE) has the assigned roles of education, administration, politics, judiciary and media. The sub-standard variety of English otherwise called Pidgin, known also as interference variety, has the assigned role of informal interaction. Read more on other concepts of sociolinguistics on this site. Share this post with your friends and send in your comments. See you around!